The Toronto Beavers have selected a stadium name appropriately called THE BEAVER DAM. Naming rights will be available; however, any corporate sponser will precede BEAVER DAM in the title. The best stadium names in the sportsworld are usually nicknames like the Igloo (Pitt Penquins), the Shark Tank (San Jose Sharks), or the Big House (Mich Wolverines), etc. We believe the integrity of our name is important to our fans and for marketing/merchandising opportunities. Ideally we'd like to see a reintepretation of an acutal beaver dam on the front facade for the 21st century. A stadium that's uniquely Canadian, iconic, and urban in order to blend with the Toronto waterfront and city. We've just begun looking for architects and artists who might contribute. The stadium will be fitted for professional football and/or professional hockey. We are truly excited and commited to building a state of the art sports complex that will complement the other great buildings Toronto has to offer. A stadium that both Toronto and Canada can be proud of. The Toronto Beavers hope to secure UK mulit media artist and Turner Prize nominee Julian Opie and/or naturalist and wildlife painter Walton Ford. 1. OPIE - Recognized around the world for his life size creations that look just as striking on a gallery wall as they do on a building facade, in a park, or in any urban environment. Opie once dated supermodel Kate Moss and choosing not to move ahead with his Turner nom because there were "too many hoops" speaks to his grounded sensibility. Andy Warhol is a former Turner recipient. Opie has worked with galleries and cities around the world and would be ideally suited for a large scale sports project of this kind of cultural significance. His recent exhibit at the AGO scaled approx 3 stories high. 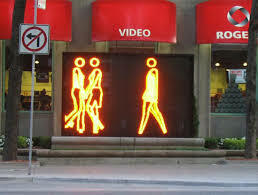 Communications titan Ted Rogers is also a fan of his work and features a moving Opie LED in front of his head office on Bloor Street. The Beavers hope Opie and an architect like Frank Gehry might consider the project. What does art have to do with football. Let's wait and see what Opie has in mind but we think he fits the project perfectly. After all our dual beaver aquariums in the front entrance were inspired by Opie. 2. FORD - recognized as on of the great modern day wildlife painters and naturalists. Ford's not afraid to go for a hike with a flask of brandy to get inspired. Since the Beaver and Canadiana will provide the icons for our new sports franchise, brand, and stadium, we're hoping Ford considers the project. Ford's large scale beavers, his touch of irony, and tongue and cheek interpretations would be perfect for what will be the greatest sports stadium built on Canadian soil. Don't sleep on the Toronto Beavers because if Southern Ontario gets a new NHL hockey team before Toronto gets an NFL football team, we can get behind this decision in a real hurry. How about the Hamilton KW Beavers? The Kitchener Waterloo Beavers or the Hamilton KW Beavers or the Toronto Beavers, it's all the same. A brand that makes sense. We're putting NHL Hockey and NFL Football on the same page. When asked whether he could see another NHL team in Canada or Southern Ontario? TORONTO GETS IT'S CULTURAL CENTREPIECE @ THE AGO - NOW ARE YOU READY FOR SOME FOOTBALL? If "a new art museum is a proud beast?" Then what's an NFL Football stadium called The Beaver Dam? Says Robert Fulford of the National Post, "it's in the business of mass self esteem." You are now entering the Beaver Dam. The world's greatest stadium ever built. You are now entering the Beaver Dam. The world's greatest stadium ever built.You are now entering the Beaver Dam. The world's greatest stadium ever built.You are now entering the Beaver Dam. The world's greatest stadium ever built.You are now entering the Beaver Dam. The world's greatest stadium ever built.You are now entering the Beaver Dam. The world's greatest stadium ever built.You are now entering the Beaver Dam. The world's greatest stadium ever built.You are now entering the Beaver Dam. The world's greatest stadium ever built.You are now entering the Beaver Dam. The world's greatest stadium ever built. You are now entering the Beaver Dam. The world's greatest stadium ever built.You are now entering the Beaver Dam. The world's greatest stadium ever built.You are now entering the Beaver Dam. The world's greatest stadium ever built.You are now entering the Beaver Dam. The world's greatest stadium ever built.You are now entering the Beaver Dam. The world's greatest stadium ever built.You are now entering the Beaver Dam. The world's greatest stadium ever built.You are now entering the Beaver Dam. The world's greatest stadium ever built. You are now entering the Beaver Dam. The world's greatest stadium ever built.You are now entering the Beaver Dam. The world's greatest stadium ever built.You are now entering the Beaver Dam. The world's greatest stadium ever built.You are now entering the Beaver Dam. The world's greatest stadium ever built.You are now entering the Beaver Dam. The world's greatest stadium ever built.You are now entering the Beaver Dam. The world's greatest stadium ever built. You are now entering the Beaver Dam. The world's greatest stadium ever built.You are now entering the Beaver Dam. The world's greatest stadium ever built.You are now entering the Beaver Dam. The world's greatest stadium ever built. You are now entering the Beaver Dam. The world's greatest stadium ever built.You are now entering the Beaver Dam. The world's greatest stadium ever built.You are now entering the Beaver Dam. The world's greatest stadium ever built.You are now entering the Beaver Dam. The world's greatest stadium ever built.You are now entering the Beaver Dam. The world's greatest stadium ever built.You are now entering the Beaver Dam. The world's greatest stadium ever built.You are now entering the Beaver Dam. The world's greatest stadium ever built.